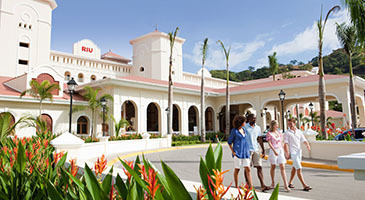 Make long-lasting memories on a RIU Hotels & Resorts vacation. Whether it’s building sandcastles in Cancun, eating a candle-lit dinner in Jamaica, or sliding through Splash Water World in Punta Cana, these resorts offer unique experiences that you and your family will hold onto for a lifetime. Plus, it's easy to bring your family closer with guaranteed adjoining rooms. Delta Vacations gives you more ways to rack up miles, and earn toward your Medallion® Status. SkyMiles® Members earn 3,000 bonus miles per person, in addition to credited flight miles, with a flight and RIU Hotels & Resorts package. *Sample Pricing: This offer is available from hundreds of origin cities, but this price, which reflects the offer, is based on travel between Atlanta and Cancun, staying at Riu Dunamar. Price is per person, based on double occupancy and select Tuesday departures and Sunday returns, June 18 – 23, 2019, and is subject to change. Additional restrictions and baggage charges may apply. See Terms and Conditions for details. With fantastic destinations in Mexico, the Caribbean and Central America, RIU Hotels & Resorts offer an extensive all-inclusive program, complete with lively activities and watersports, spacious accommodations, in-room minibars, delectable dining and an abundance of amenities. These resorts cater to friends, couples and families of all ages. Friends and couples can relax on complimentary loungers by the beach or join in poolside games, while kids enjoy RiuLand — an activity and entertainment program for kids 4-12 years old — plus children’s pools at select properties. 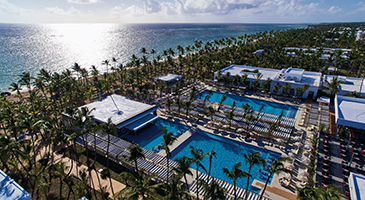 This all-inclusive resort, on lovely Arena Gorda Beach in Punta Cana, offers a wide variety of family-friendly amenities. In addition to palm groves over spacious grounds, other highlights include nightly entertainment, a casino, a variety of restaurants and bars, a separate swimming pool, water park and supervised activities for children. Situated on the seafront in the beautiful region of Guanacaste, amidst tropical palms and lush gardens, this all-inclusive resort offers a wide array of watersports and activities like diving, kayaking and windsurfing, as well as tennis and beach volleyball. This vast, all-inclusive beachfront resort features rooms with balconies or patios, and offers a fantastic children's program, many daily activities and nightly entertainment. Guests also delight in delicious local dishes prepared each day. With three outdoor swimming pools, a sun terrace and spa, this resort is great for friends, couples and families. Riu Palace Pacifico is located on Flamingo Beach, only a two-minute drive from Riu Vallarta and Riu Jalisco, and just nine miles from downtown Puerto Vallarta. Magnificent architecture and elegant furnishings, combined with unparalleled service, will offer guests the highest level of distinction, making this the ideal place for vacationers seeking total relaxation in luxury and comfort. Riu Santa Fe is located in front of the famous arch, at the edge of one of the most beautiful beaches on the southern end of the Baja Peninsula. Less than three miles from Cabo San Lucas, this resort contains first-class facilities, including specialty restaurants, a variety of lounges, an onsite disco and aquatic park, as well as a spa offering massage treatments and salon services. *Price is per person, based on double occupancy at Riu Dunamar, between Atlanta and Cancun. Tuesday departures and Sunday returns via nonstop service on Delta and certain Delta codeshare partners, and is valid for specific travel dates June 18 – 23, 2019. Advance purchase requirements vary. Other travel days and dates and accommodations are available at other prices. May require travel on specific flights or times; blackout dates may apply. 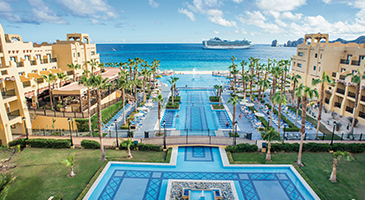 Purchase any Delta Vacations flight and RIU Hotels & Resorts package from any Delta Vacations origin in the U.S. or Canada to Mexico, the Caribbean or Central America. At time of reservation, you must refer to promotional code DV32762 (all properties) or PMRIUMEX1/PMRIUMEX2 (select properties). The hotel discount is based on the standard room charges of each of the participating hotels in Mexico, the Caribbean or Central America. Not combinable with promo codes PMRIUMEX1 or PMRIUMEX2. Participating hotels include: Mexico: Cancun — Riu Cancun, Riu Caribe, Riu Dunamar, Riu Palace Costa Mujeres, Riu Palace Las Americas and Riu Palace Peninsula; Los Cabos — Riu Palace Baja California, Riu Palace Cabo San Lucas and Riu Santa Fe; Mazatlan — Riu Emerald Bay; Riviera Maya — Riu Lupita, Riu Palace Mexico, Riu Palace Riviera Maya, Riu Playacar, Riu Tequila and Riu Yucatan; Riviera Nayarit — Riu Jalisco, Riu Palace Pacifico and Riu Vallarta. Dominican Republic: Punta Cana — Riu Bambu, Riu Naiboa, Riu Palace Bavaro, Riu Palace Macao, Riu Palace Punta Cana and Riu Republica. Jamaica: Montego Bay — Riu Montego Bay, Riu Palace Jamaica and Riu Reggae; Negril — Riu Negril and Riu Palace Tropical Bay; Ocho Rios — Riu Ocho Rios. Bahamas: Nassau — Riu Palace Paradise Island. Costa Rica: Liberia — Riu Guanacaste and Riu Palace Costa Rica. Aruba: Palm Beach — Riu Palace Antillas and Riu Palace Aruba. Panama: Playa Blanca — Riu Playa Blanca. Book by April 30, 2019, for travel through December 31, 2019. Not combinable with promo code DV32762. Minimum 4-night minimum stay required. Discount is $200 on bookings of 4 to 6 nights with promo code PMRIUMEX1. Discount is $300 on bookings of 7 nights or longer with promo code PMRIUMEX2. Package purchase includes flight and hotel; or flight,hotel and car rental, plus any optional activities. Book by June 30, 3019, for travel through October 31, 2019. Discount is not applicable to airfare; Ski, Dive or Globus family of brands including Globus, Cosmos, Monograms and Avalon packages; for groups of 10 people or more; and is not retroactive. All SkyMiles Program rules apply. To review the rules, please visit delta.com/memberguide. Delta Vacations airfares will earn Medallion Qualification Dollars (MQDs – U.S.-based members only) based on fare class and distance flown. Bonus miles do not count towards Medallion Status or Million Miler™ Status. Offers void where prohibited by law. Offers subject to change without notice. Other restrictions may apply. TA: -2% points with promo code DV32762. Enter promotional code DV32762 (all properties) or PMRIUMEX1/PMRIUMEX2 (select properties) in the Promo Code/eCertificate box on the Booking page. Kids, 12 years old and younger, stay and eat free when sharing a room with an adult. Available at: Riu Bambu, Riu Guanacaste, Riu Negril and Riu Santa Fe. Book by April 30, 2019, for travel May 1 – December 23, 2019. 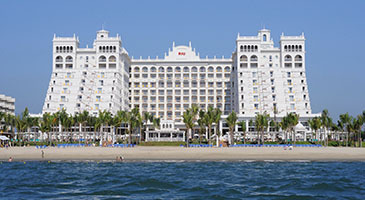 Guests of Riu Palace Pacifico receive $1,290 in resort credits, per stay, at check in, based on double occupancy. $200 credit at Renova Spa includes two coupons of $15 for Renova Spa Combination (80 min. ), two coupons of $10 for Stress Cure Massage (80 min. ), two coupons of $25 for Ocean Harmony “Special for Couples”, two coupons of $10 for spa pedicure and manicure, two coupons of $10 for Spa Lavad, Secad and manicure, two coupons of $15 for Huichol Ritual/Sweet Damiana/Cactus Ritual (80 min.) and two coupons of $15 Luminous Skin Facial (60 min.) with Relaxing Massage (50 min). Limited to one coupon per service, per person. $110 credit toward purchase at Scuba Caribe includes two coupons of $20 for Caletas beach hideaway snorkel tour, two coupons of $10 for Ocean mania, two coupons of $15 for Luxury Sailing and two coupons of $10 for Hobie cat lesson. Limited to one coupon per service, per person. $100 credit toward Diamonds International includes one certificate of $100 plus gift (gift to be collected in store) per stay. Valid with minimum purchase of $250 in jewelry. $600 credit toward Flamingos Golf & Country Club includes coupons of $50 broken out as $15 for tee times and $35 for golf clubs for rent. $200 credit toward Weddings by RIU applied toward Royal & Caprice Wedding. $50 credit at Paparazzi Photography includes $50 coupon valid toward Atlantic Package which includes: photo session with professional photographer, 49 HD digital images, 2 prints 8x10, 1 print 5x7. Or toward Pacific Package which includes: photo session with professional photographer, 99 HD digital images, 2 prints 8x10, 1 print 5x7. $30 credit towards Alamo Rent a Car. Two coupons of $15 for 48 hours rental of midsize car or higher class. Driver must be older than 25 years old. Guests will receive coupons upon check-in. The total of credit is per room, for guests 21 years and older and limited to one coupon per service, per person. Resort credit is non-transferable, non-cumulative, non-refundable, non-combinable, and cannot be used for future stays. Resort credit can be used as a discount only for selected services. Credits cannot be exchanged for cash. This promotion is subject to availability and can change without notice.